About – TLC Heritage Of India Ltd.
State of Rajasthan – Land of rich Culture offering Cultural tours, Heritage hotel Tour, Temple Tour, Village Safari, Camel Safari, Horse Safari, Jeep Safari, Wildlife – Tiger / Leopard (Rich Flora n Fauna), Trekking Tour – soft trek too, Cycling Tour, Biking Tour , Train Tour and offering Exotic Venues for Royal (regal) Wedding – Complete package in the cities of lake / lakes, Venice of East and Kashmir of Rajasthan as popularly known (Udaipur Hotels / Udaipur Palaces – A city of Lake Palace , Haveli and Island Palaces mainly Lake Palace & Jagmandir – A romantic wedding venue witnessed weddings of celebrities and events of world class), Hotels in Udaipur which included Fatehgarh, Udaipur; Chunda Palace, Udaipur; The Royal Retreat, Udaipur; Ram Pratap Palace, Udaipur and Labhgarh Palace, Udaipur and hotels near Udaipur Fort Dhariyawad and Aranyawas, Ranakpur a palace known for Jain Temples all are witness to theme wedding , Royal / Regal wedding, events, product launch, Film shoot. Royal / Regal Wedding with a complete package for individuals to a complete family wedding (Royal/ Regal) can be planned and experienced. With presence in Udaipur wedding with Economy (Economic Hotels / Tours) – Budget wedding (heritage budget hotels) up to Luxury events and royal / regal wedding can be planned. Accommodation in all segments available, Heritage Hotels – Budget (with special discounts & special offers, very budget tours, bed and breakfast tours, heritage homes stays, lake facing rooms to city palace view rooms / accommodation. 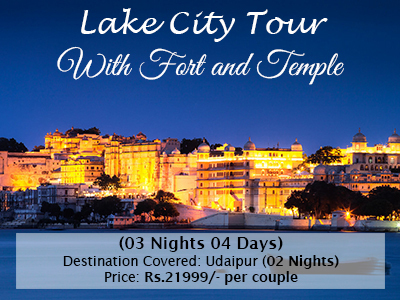 Udaipur Hotel packages are special discounted tour packages – complete package to meet all requirements.